For centuries the area around Vyborg saw the bitter rivalry between Russia and its neighbors. 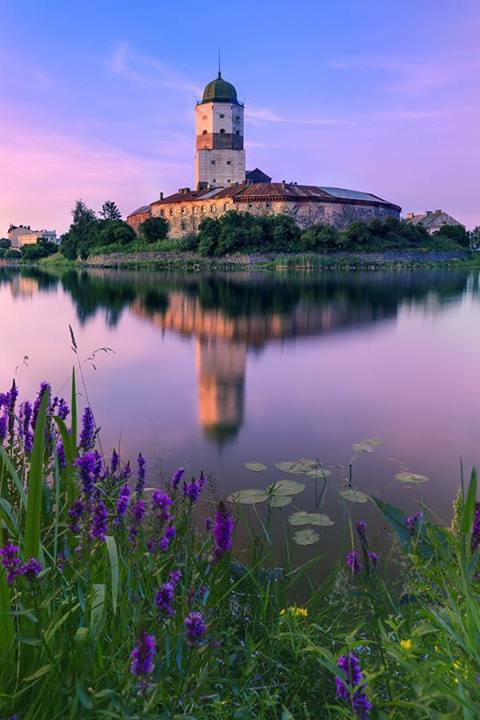 The Vyborg Castle, built in 1293 on a small island Linnan-Saari off the Baltic coast, was a powerful Swedish stronghold. The castle was blocking a major trade route between the Russian merchant city of Novgorod and the Baltic Sea, trough the Ladoga Lake via the Vuoksa River and the Russian fortress Karela (the modern-day town of Priozersk). The castle, with its tall Olaf Tower, was built with the latest fortification technology of the day. The Russian forces of the Principality of Novgorod laid siege to the castle several times but unsuccessfully. In 1318 the army of Novgorod managed to take the castle, but failed to establish tight control over the area and had to retreat.In 1561 the Olaf Tower was rebuilt on the orders of King Gustav Vasa. The tower became a little shorter, but with thicker walls and more powerful defenses. In 1564 additional fortifications were added, including outer walls and powerful bastions paved with stone. The lively medieval town of Vyborg, located opposite the castle, was fortified as well. This part of the town is still referred to as "the Old Town" and retains much of its medieval character. Several towers in the Old Town used to be part of the town fortifications, built in the late 14th century - early 15th centuries and expanded in 1547-50. The most famous is definitely the Round Tower ("Fat Catherine"), which now stands on the Market Square. The tower was built of large stones and was strong enough to hold canon on several levels.